Reverse negative output tax in GST-03 - MyOne Technologies Sdn. Bhd. Generally the column 5b in GST-03 recorded the total output tax amount. When you have credit note or adjustment more than the actual sales, the amount will shown in negative. To reverse the negative GST tax amount, you need to pass a manual journal entry. In order to reverse the negative amount from column 5b to 6b, you need to pass the following journal entry. Be aware of the transaction date you enter. Enter the last date of the GST period e.g 30 June. 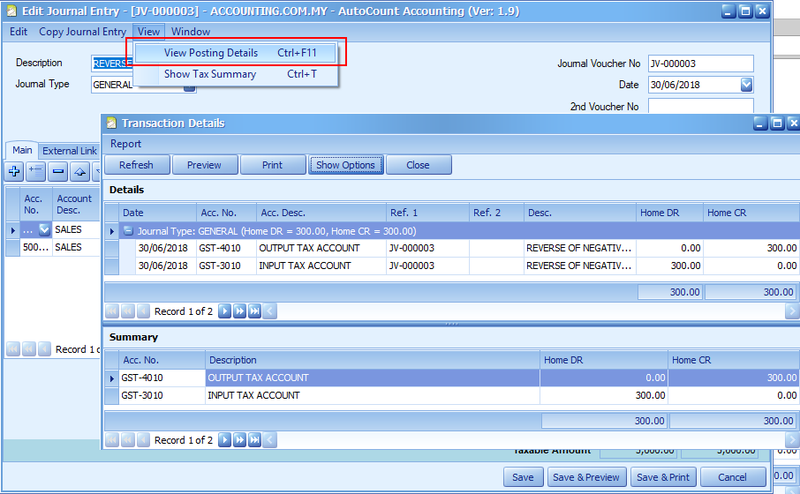 Create 2 entries, first entry select as Purchase “P” and AJP-O tax code. If the AJP-O tax code is not available, you need to enable it in GST Tax Code Maintenance. Second entry select as Supply “S” and SR-S tax code. Debit taxable amount and credit taxable amount to make it tally. You may click to check the posting details. 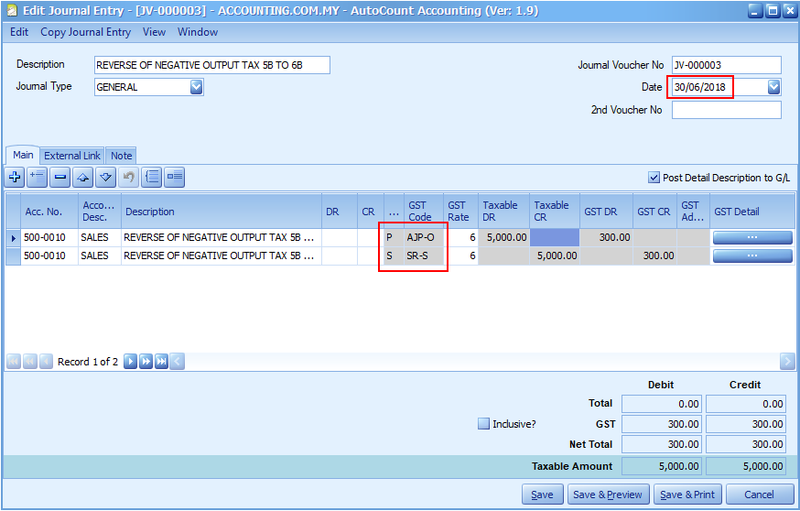 For negative input tax in 6b, you use the same method to pass journal entry with AJS-O tax code. Once done you can run the GST processor. I see. Btw, could you explain more on what you had mentioned: “In order to reverse the negative amount from column 5b to 6b, you need to pass the following journal entry”. I don’t really understand for the code used of Dt Input and Ct Output. And is it the amount just for the CN? Hi, nice posting. However, may I know where did you get the amount of Rm5,000.00 and Rm300.00?